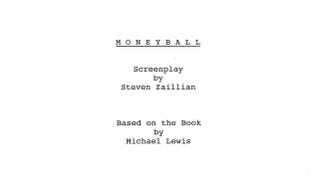 It looks like Moneyball might not be coming to the big screen anytime soon because director Steven Soderbergh tinkered with the script and everyone realized that a movie version of the book made about as much sense as Joe Morgan. But an earlier draft of the script, dated Dec. 1, 2008, is making its way around the Web. It's 129 pages, which means it's up to the intern to parse through it, pick out the good parts and then compile the particularly entertaining excerpts. It wasn't hard to find a handful of lowlights, and in addition to the ones included, there are a surprisingly large number of pointless factual inaccuracies: The Charlotte Knights are Triple-A, not Double-A; Scott Hatteberg never played one year for the Rockies; Bryan Bullington and Roger Ring were not the draft choices directly before Jeremy Brown; and when Olmedo Saenz grounded out in the ninth inning of the fifth game of the 2001 ALDS, there were no outs, not one, thank you very much. Besides that — and plot twists that pit Beane as an avid concertgoer and convert Paul DePodesta into a weightlifter — the screenplay made me wish some studio would take a chance with this movie, even if Michael Lewis himself didn't see the movie in the book. The first two acts are slow, relying on Bill James to explain sabermetrics to the women dragged to the theater by their geeky boyfriends brothers. The last 30 pages, though, are as action-packed and climactic as a trading deadline and AL West race can be. And yes, there are cameos from Lenny Dykstra and Joe Morgan, outright allusions to Roy Hobbs and Jimmy Stewart and subtle nods to Bobby Knight and Angels in the Outfield. It's Moneyball, coming to a theater near you... well, maybe never, but hopefully soon. "OK, Let's start with a naked Billy Beane, the steam rising off the shower and crowning his head, like... God!" "Great idea, but here's a better one. We'll cut to a Bill James voiceover, and then cite Henry Chadwick." "Oh, I like it. But it's a bit too, hmm, secular. Let's throw some stigmata in there." "You sure you want to go that route?" "Absolutely. And blood! Lots of blood!" Lest the movie offend the Jewish crowd, Arn Tellem makes a cameo when Beane goes to Tellem's son's bar mitzvah and, like everyone else, struggles to keep a yarmulke on his head. Bobby pins, Billy. That's the trick. And don't be depressed — bar mitzvahs are fun! A few scenes in and Beane's already throwing chairs against the big board. Nobody pays any attention. Apparently there is fighting in the war room. I think this is the beginning of a beautiful uncomfortably intense friendship. Because after you seduce an Outback waitress, your next step isn't to call the Indians' general manager in the middle of the night? Ah, Christmas — makes more sense than you think. But don't bother trying to figure out how It's A Wonderful Life comes into play. I thought this was the most entertaining soliloquy of the movie, but then everyone's favorite Sunday Night Baseball analyst makes an appearance. And the Lord said, "Ask and ye, Chad Bradford, shall submarine, no problem." Well, all of this certainly makes a lot more sense now. Lenny Dykstra Lets The World Know He&apos;s "Flying Higher"
From bar mitzvahs to Auschwitz? Let's hope this was one of the segues Soderbergh edited out. One of the screenplay's more puzzling revelations is that Jeremy Giambi is obsessed with The Natural. And, apparently, he's so caught up in the climax that he yells, "Yeah, Hobbs!" even though he's seen it hundreds of times. Also, this is why Beane trades him. Yeah, Beane! Billy Beane and fantasy baseball owners across the country: not so different after all. Should make for an interesting Spanish subtitle.